The thing about storage is that it can be ugly and intrusive. Pick the wrong storage option for your backyard and nothing ruins the aesthetic layout more. The good news is that outdoor storage doesn’t have to be an eyesore. Whether you go with a shed or shelving, if you choose based on landscape design, material quality, and scale, your backyard storage can be a thing of beauty – or at the very least mildly attractive. As you might guess, taking an honest inventory of what you need stored is the first step toward finding the right storage solution. Make a list of the things you know you need a place for, including lawn mowers, pool equipment, unused outdoor furniture, and gardening and maintenance supplies. In addition, decide if you will be storing chemicals (such as for the pool), gas, and/or paint. If so, you’ll have safety considerations and venting will be necessary. Then, look around at what you have that could use a home. Are all the kids’ toys always laying in piles on the grass? Are your outdoor holiday decorations spilling out of closets and falling from the rafters? Do you entertain often and find yourself wishing you had somewhere for all your plastic dishware and serving pieces? These are important considerations because they’ll inform how big your storage needs to be, and will prevent you from having to buy more down the road. 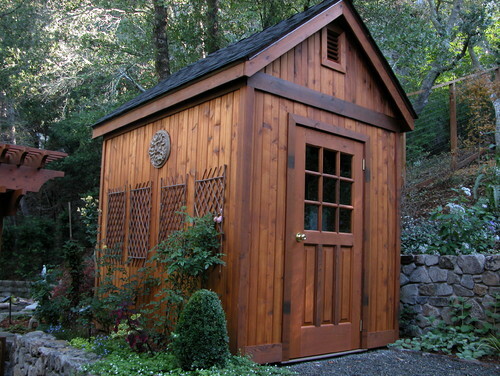 It’s far better aesthetically to have one storage shed in your yard than two if you can help it. Also, what you store will dictate how large an opening your shed or other unit should have on its exterior. You want to purchase something that can accommodate your things easily without having to pull doors off or scratch the finish off something you love. If you really want to select storage right, it’s advisable to go through your garage and apply that old “three piles” organizing rule. First, designate a pile for what gets thrown away, make another for what is to be given away, and another for what you are keeping. Take a good look at that keep pile when you are done organizing, and if some of the items can/should be stored in a shed or other unit, put them aside. Evaluate all your stuff at this point. How much room will you need to house it all? When you answer, note that most people tend to underestimate how much storage space they need, so a good rule of thumb is to size up. If you have the space, going 10% to 20% bigger than what you think you need will usually be a good call. Remember, too, that you probably want to move around inside the shed and if it’s packed full, you won’t be able to get to your stuff easily. According to CreativeOutdoorSheds.com, an 8′ wide by 12′ long storage space is good for smaller backyards and for home owners who don’t require a lot of storage. This size is best for garden tools, mowers, and perhaps a few boxes. A 10′ wide by 16′ long space is a good standard size for items like a mower, work space, and box storage, while a 12′ wide by 20′ long space is best for large backyards and will store just about everything you need, with space left over to fill later, or walk around in now. If you are still at a loss, you can gather everything you want to store, arrange it as you would in a shed or other unit, and draw an outline around it with chalk or stakes and measure the space. — What will I store in the structure? — What do I have to store that I haven’t thought of yet? — Will I use the space only for storage or do I want some work space included as well? — How often will I need access to my stuff? Obviously, the appearance of the outdoor storage you select impacts the overall look of your property. For that reason alone, you should choose a storage look that reflects your personal taste and complements the style of your home. If you have a formal-looking home, you can buy storage with arched windows to carry the theme into your yard. The same goes with more traditional homes. In that case, maybe a barn-style, rustic design is for you. Luckily, outdoor storage is now available in nearly any material and look you can think of, so consider carefully and make the storage a design extension of your home as much as you can. If you go for a shed, you can specify venting (if you’re storing paint, etc. ), custom overhangs, skylights, eaves, shutters, arched doors, decorative trim and even exterior stone accents. To carry your home’s design into your yard, you can go so far as to match roof lines, materials, door and window shapes and looks. Browse your options because everything from A-frames to greenhouse designs are available. Also, whatever color combination you choose should blend with your home. A good rule of thumb is to try to match your roof colors to the color of the storage you pick – or at least have them be complementary colors. For ultimate aesthetic effect, integrate the storage into the landscape by landscaping with plants. Adding window boxes, shutters, and faux finishes can also make your storage unit look more like a part of your property instead of an afterthought. Location, as always, is also key. The size of the storage option you choose affects where it goes. Consider neighbors’ views, your view, the lay of your land, what the space is used for, and who needs access to it, and how often. You will be more likely to use items and put them away if the storage is located close to where you most use the items. 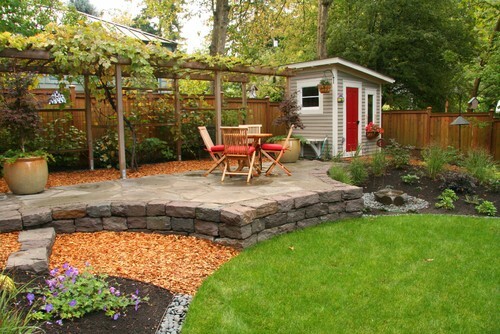 For instance, a gardening shed would be placed near the garden. 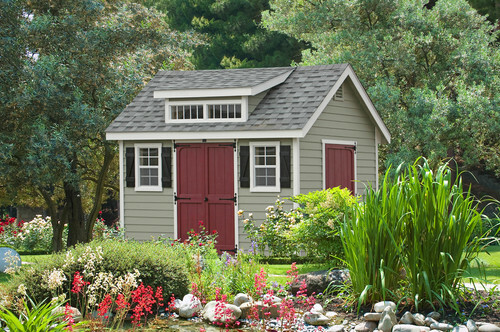 And, if you opt for a shed, most models need a flat area for the facility and its foundation. Remember to consider water patterns, too, because if water breaches your storage space, it will lead to decay. Finally, before purchasing storage for your yard, check town ordinances. This applies mainly to sheds, where ordinances can determine where you are allowed to place a shed and if a building permit is required. You may have to set your storage shed a specific distance from property lines, for instance, and there may be restrictions on the siding materials you can use. However, many towns do not require permits for structures under 100 square feet. Housing associations will also have special rules about placement and even, color, in some cases, so be sure ask before buying anything. As you decide what type of storage to opt for, its utility again should cross your mind. Are you looking for basic storage? Do you want to use the space as a potter’s shed or workshop of some sort? Will you be in and out of the storage space? Do you need easy access? Do you want to close the door and not open it again unless absolutely necessary? Deck builders can install an elevated deck with a waterproofing system so eater damage is decreased, then enclose the area beneath the deck to be used to store deck or patio furniture to even a lawn mower so it’s hidden from view. 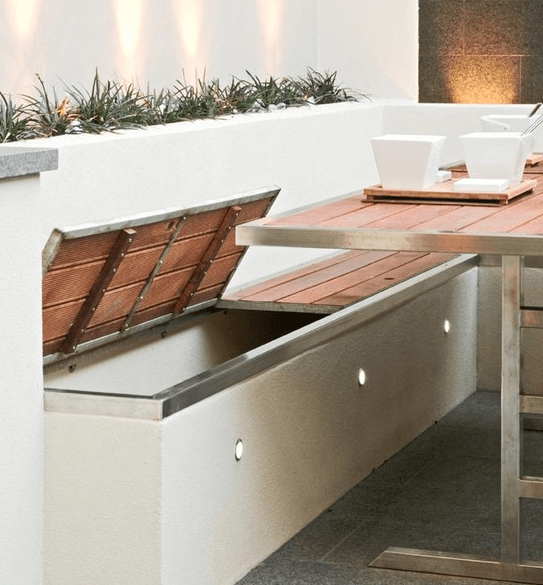 Deck benches built with a lid that opens and has hollow storage space inside are also a good option. Playhouses seem to be a counterintuitive outdoor storage option, but if you’re backyard is a playground and toys are everywhere, a playhouse can be a functional and cute backyard storage addition to house toys when they’re not in use. If you’re an avid gardener, a greenhouse offers both form and function in backyard storage. Depending on size, garden supplies big and small can be placed inside the greenhouse, and a potter’s shed can also be incorporated to keep the dirt and pots out of sight. Although more of a building project, pool pavilions and cabanas can be used for storage. After swimming season, a pool house can store pool equipment, toys and furniture. Because most pool houses are beautiful extensions of a property, they can add value to a home. Storage sheds are arguably the most common storage option and are great for storing outdoor equipment, garden tools and out-of-season stuff. Many of the sheds available today have the architectural details of a house, and can be matched to the design of your own home. Sheds can be pre-fabricated, kit versions, or newly built with your specs. Storage sheds can be made with galvanized steel or aluminum, and then coated with a baked enamel finish for durability. Metal can rust, so rust-free aluminum is usually the most popular choice in siding. Vinyl siding offers the most maintenance-free storage choice and withstands most weather conditions and UV fading well. Natural wood is a lovely shed siding choice, but it’s susceptible to rot when exposed to water. Cedar is relatively rot-resistant though and is a popular choice for outdoor storage units. Still, cedar will need to be coated with a UV-inhibiting sealer once a year. Particle board and plywood are composite woods that are also available for siding, but again, water can damage these materials and rot will occur. It all depends, of course, on size, material, and type. Expect to pay anywhere from a few hundred dollars to upwards of three thousand if you opt for a customized shed. Outdoor storage can be a sticky wicket. We all need storage, but choosing an option that’s functional and attractive can be a challenge. Either way, incorporating storage can be a major time and labor saver. Choose wisely and you’ll never go back to a storage-less yard. What do you use for backyard storage?